A superbly presented and extended semi detached home situated in this HIGHLY SOUGHT AFTER LOCATION within WALKING DISTANCE OF HEMEL and APSLEY STATION as well as being within HEMEL SCHOOL CATCHMENT. With a LARGE LOUNGE, refitted kitchen diner, downstairs cloakroom, THREE DOUBLE BEDROOMS and a LUXURY FOUR PIECE BATHROOM. The property also boasts LARGE GARDENS and driveway parking for more than one car. 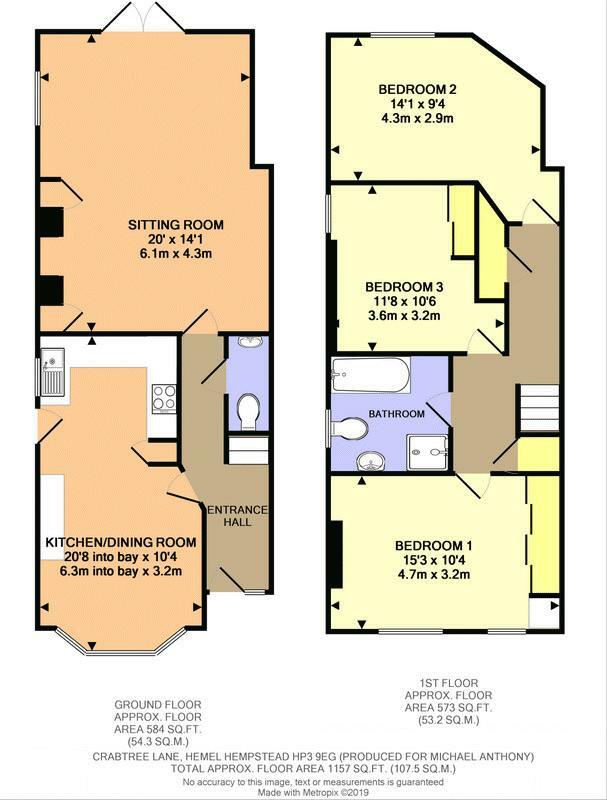 Stairs to first floor, understairs storage cupboard, radiator, doors to cloakroom, kitchen/diner and lounge. Low level w.c. wash hand basin with mixer tap granite tiled floor and splash back. Part glazed door to a dual aspect room with double glazed window to side aspect and double glazed French doors to the rear, built in storage cupboards, two radiators, recessed spot lighting, wood flooring. Wall mounted TV point. Part glazed door to a dual aspect kitchen dining room with a double glazed bay window to front and double glazed window to the side. Fitted with a range of high gloss base and eye level storage units with granite work surface areas and breakfast bar, built in oven and hob with canopy extractor fan over, sink and drainer with mixer tap, space for American style fridge/freezer and dishwasher both included in the sale price, integrated washing machine, and microwave, wine rack. Wall hung radiator, cupboard housing wall mounted radiator serving central heating and hot water, recessed spot lighting, double glazed door to side aspect. Two Storage cupboard, access to loft space, doors to bedrooms and bathroom. Two double glazed windows to front aspect. Built in wardrobe, radiator. TV point. Double glazed window to rear aspect. Radiator, TV point. Double glazed window to side aspect. Built in wardrobe, radiator, TV point. Double glazed window to side aspect. Four piece suite comprising low level w.c pedestal wash hand basin with mixer tap, panelled bath with central mixer tap, shower cubicle, wall mounted heated towel rail, recessed spotlighting. Block paved driveway providing off road parking for two cars. A feature of the property is the generous fully enclosed rear garden, with composite decked seating area to the immediate rear, laid mainly to lawn with central pathway leading to two storage sheds, bark borders for ease of maintenance, gated side access.